The perverse unfairness of the human lot is not lost upon children, and they begin ruminating about death from an early age. They grieve in anticipation of the death of their parents, they cry at the funerals of pets, they anguish over their own eventual demise. Depicting the inevitable cycle of life and death, children’s literature is replete with the tragic endings of beloved characters. Who has not shed tears at the death of Charlotte the spider or Beth in Little Women or Old Yeller? With the angst associated with mortality as the norm, it is unsettling to read Tuck Everlasting which portrays a family condemned to immortality. Mae and Angus Tuck, along with their two sons and their horse, happened upon a forest spring 87 years earlier which, unbeknownst to them, conferred eternal life. The youngest son, now 104, is doomed to be a 17 year old teenager forever. The older son was abandoned by his wife after twenty years of marriage: fearing the hand of the devil, she took their two children with her. The family is forced to lead a lonely wandering life, unable to put down permanent roots or develop friendships. When ten year old Winnie, the protagonist, discovers their secret, she is faced with the choice of joining the Tucks in their immortality or accepting her three score and ten. It is Angus, the melancholy and gentle father, who ruminates upon the meaninglessness of life without change, growth, and death. This is a thought provoking book of considerable sophistication and depth. Consider Angus’s theory, for example, that the spring was an isolated remnant of an alternative world plan, subsequently abandoned. Or the Tuck’s speculation about other souls who might have drunk from the spring, roaming the world in a similar suspended state of endless being, but with no marking to permit recognition by fellow immortals. These provocative ideas are presented alongside a plot line that includes a kidnapping, jail-break, and murder, enlivened further by a Mephistophelian yellow-suited huckster lurking in the woods. Natalie Babbitt is a gifted writer who weaves her narrative through startling descriptive prose: “the hard brown-yellow light” heralding impending rain or the way Winnie’s mother and grandmother sit in the darkened parlor, “their knees loose” in the oppressive heat. It is an unusual book with an unusual tone that defies easy characterization – part Southern gothic, part New England puritan, part Midwestern goodness. Survival in the wilderness makes for an oddly compelling story. Robinson Crusoe, the original castaway, launched the genre. Written in 1719, Daniel Defoe recounts the tale of a shipwrecked Englishman who makes a life for himself, fortified by the Bible, a herd of goats, and his man Friday (never was a footprint in the sand so welcomed – as much by the reader as by Crusoe). A quarter millennium later, Jean Craighead George wrote Julie of the Wolves. An Inuit girl gets lost in the Alaskan tundra, and her survival is dependent upon her acceptance by a wolf pack. The two books reflect a sea change in attitudes towards human civilization and nature between the 18th and 20th centuries. In Island of the Blue Dolphins, the 12 year old Karana is neither castaway nor lost. She is simply left behind, to live a solitary existence on the island that was always her home. A member of the Nicoleno tribe, her community is decimated by Aleut and Russian sea otter hunters who make her island their base. The surviving tribespeople are rescued by a ship sent from the mainland, but Karana swims ashore to save her younger brother and a storm forces the ship’s departure. After the boy’s death by wild dogs, Karana is alone. She builds a fortified home with a whale bone fence, hunts and gathers a diet of abalone, fish, and tubors, tames the alpha dog to be her companion, and makes peace with her solitude. After 18 years, a ship arrives and she leaves her island home. Scott O’Dell based his Newberry award-winning book on the true story of the Lost Woman of San Nicolas. In reality, her “rescue” in 1853 was followed by her death from dysentery after only a few weeks of life in Santa Barbara. San Nicolas is one of eight Channel Islands that lie off the coast of southern California. Five of the islands comprise the Channel Islands National Park and each of them warrants a visit. The layers of human history (Indian middens, abandoned ranch buildings, tales of rum-running during Prohibition) are interwoven with remarkable wildlife. Visit Santa Rosa for its stand of Torrey Pines and its pygmy mammoths (no longer roaming), Anacapa for its miniature yellow coreopsis forests and surfing seals, Santa Cruz for its cathedral-like Painted Cave (the world’s longest sea cavern), Santa Barbara for its gale-force winds and brown pelican rookeries, and San Miguel for its beach with 100,000 noisy pinnipeds hauled up in the sun. San Nicolas, home to a desolate navy outpost, is accessible to only a few. No one can dispute that the first half of The Lion, the Witch, and the Wardrobe is marvelous. Four children land in the country manor of a Professor, sent by their parents from London during the war. While exploring, Lucy, the youngest, slips into a large wardrobe, pushes through the hanging fur coats, and finds herself in a snowy woods illuminated by a glowing lamp-post. She encounters a Faun scurrying along under an umbrella, joins him for tea in his cozy den, and learns of the evil White Witch whose magic has imprisoned the land in endless winter. Lucy’s brother, Edmund, prone to unpleasant teasing and general beastliness, is the next of the four to discover Narnia. The White Witch pulls up in her reindeer-drawn sleigh: he succumbs to the temptation of her enchanted Turkish Delight (a delightful touch) and becomes her minion. So far, so good. The prose is effortless, the characterizations deft, the details imaginative, the adventure enthralling – a children’s book that approaches perfection. The problem comes with the first mention of the lion’s name. By now, all four children are in Narnia and the battle of good vs. evil has begun. “’They say Aslan is on the move,’” says the kind Mr. Beaver. Each of the four children experiences an ineffable feeling upon hearing the name (in the case of Edmund one of “mysterious horror”) and we sense a first false note. Our discomfort grows when we arrive at the bizarre sadistic sacrifice of the noble lion and the subsequent unrestrained joy of the girls when Aslan comes back to life. The weird mystical intensity seems out of place in a book that began with such good hearted and imaginative promise. There is something insufferable about a reformed sinner. C.S. Lewis converted back to the Anglican Church at the age of 32 and he devoted his subsequent writing to Christian apologia. Although children are usually unaware of the Christian subtext in The Lion, the Witch, and the Wardrobe (and the other six volumes of the Chronicles of Narnia), those who revisit these childhood favorites as adults often feel betrayed. There is something distasteful, even underhanded, about disguising Christian allegory as a fantasy adventure. So it may be best to leave The Lion, the Witch, and the Wardrobe to children, who can enjoy the remarkable tale in a state of innocence. 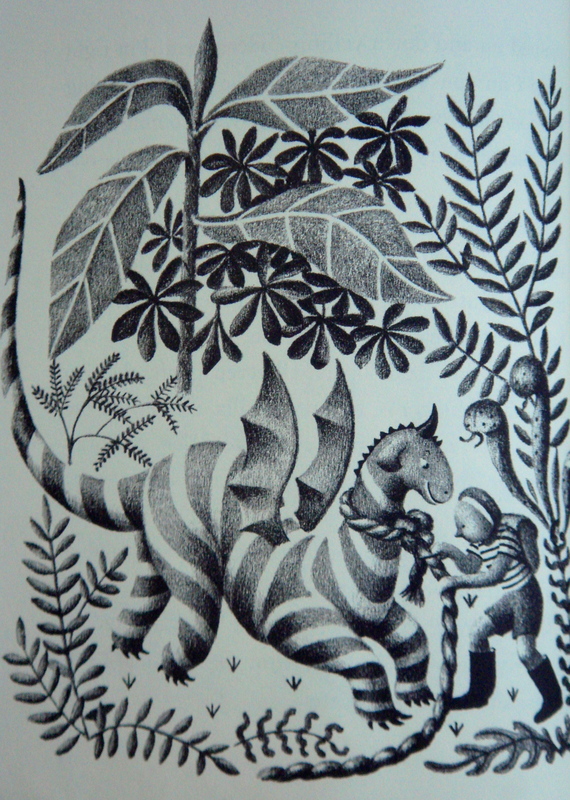 Paired with the natural prose are the perfect pen and ink drawings of Pauline Baynes. Her iconic illustrations capture the unforgettable imagery that defines the book in our memory – the lamp-post in the woods, the Faun with his umbrella, the White Witch in her sleigh. For a Victorian era woman, Edith Nesbit led a highly unconventional life. She married only after she was seven months pregnant and thereafter tolerated a ménage a trois which included her former best friend. She herself had affairs with a number of others, including George Bernard Shaw. She cut her hair short, smoked openly, and co-founded with her husband the socialist Fabian Society. She was the breadwinner of a household that included her own children as well as those of her husband’s mistress who she raised as her own. 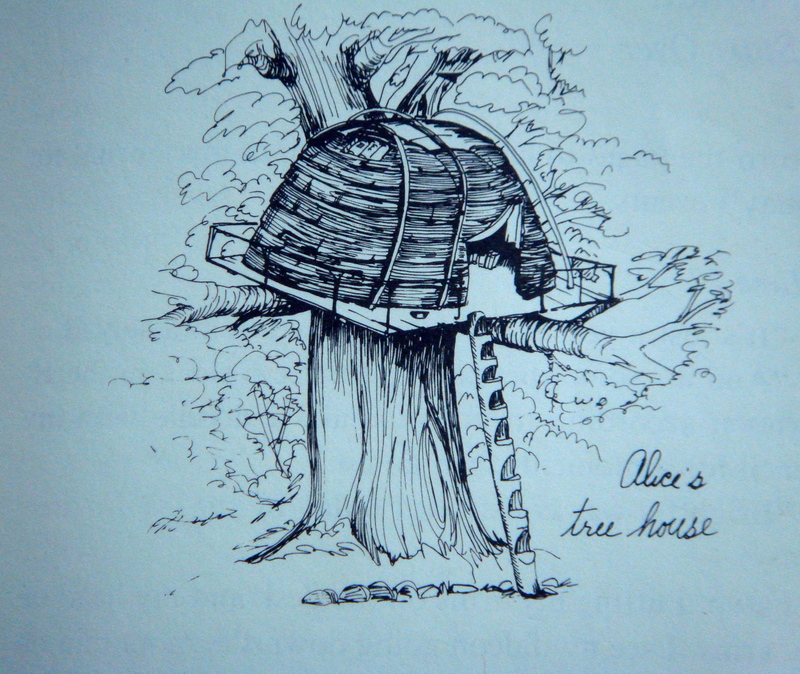 Though not particularly fond of young ones, her literary success came with her books for children, beginning with The Story of the Treasure Seekers in 1899. For the next prolific decade, she published two or three or four books a year, many of them remarkable. The Railway Children is one of her most heartfelt books, perhaps because it is her most autobiographical. The three children, Roberta, Peter, and Phyllis, are whisked out of their comfortable servanted life after the mysterious disappearance of their father and deposited in a country cottage existence of relative poverty (“’Jam or butter, dear – not jam and butter.’”) Their mother closets herself to write. The children, left to their own devices, center their lives on the railway line down below in the valley and its attendant station. They are befriended by Perks the Porter, the Station Master, and an old gentleman on the 9:15 up (the daily train to London which they christen the Green Dragon). The children avert a series of disasters – they signal a train to warn of a potentially deadly landslide, they save a baby from a burning barge, they rescue a boy who has broken a leg inside a tunnel. They provide shelter for a Russian émigré writer who has escaped from Siberia and is desperate to find his wife and children (a character based upon a friend of the author). Through their many adventures runs the suspenseful thread of the mystery of their father’s absence (an absence no doubt inspired by the contemporaneous Dreyfus affair). In addition to her realistic fiction, of which The Railway Children is the most celebrated, Nesbit created a fantasy genre in which everyday children stumble upon a key to magical happenings, often with awkward consequences. The Psammead trilogy (Five Children and It, The Phoenix and the Carpet, and The Story of the Amulet) and The Enchanted Castle paved the way for C.S. Lewis, Edgar Eager, and J.K. Rowling. 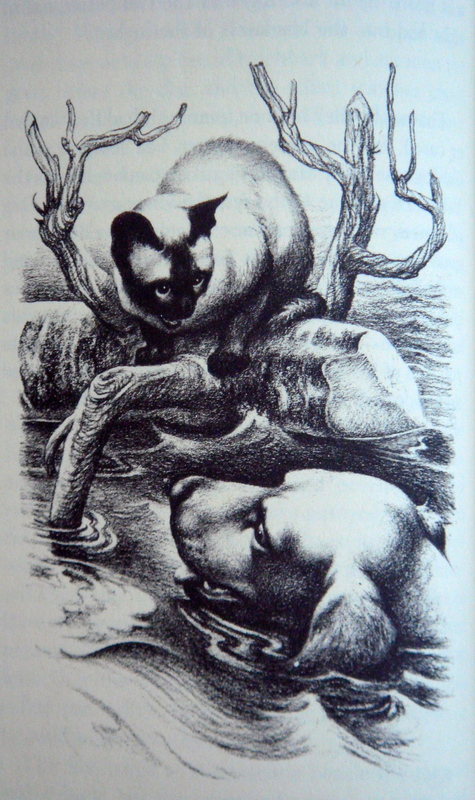 None of her successors has matched her imaginative creation of the Psammead, an irritable sand fairy who begrudgingly grants wishes and who has the shape of a furry spider, ears like a bat, extremities of a monkey, and eyes on retractable horns like a snail. 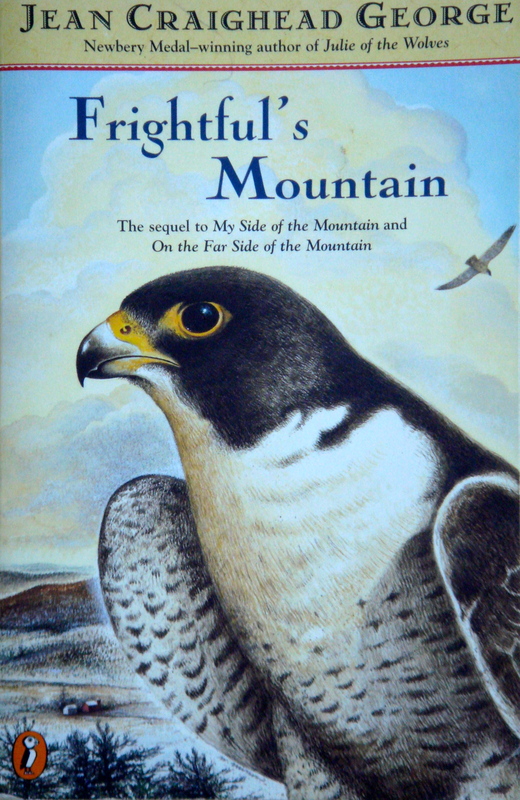 My Side of the Mountain is the first of a trilogy, written over a 40 year period, that includes On the Far Side of the Mountain and Frightful’s Mountain. Young Sam Gribley, with the blessing of his parents, runs away from their home in New York City and settles on his great-grandfather’s abandoned farm in the Catskills, taking with him a penknife, ball of cord, ax, flint and steel, and $40. Over the course of a year, he learns the skills necessary to lead a self-sufficient life in the forest. He creates a snug home in the core of an old-growth hemlock tree. He fashions deerskin clothes from road kill or animals abandoned by hunters. He spends most of his time, as hunter gatherers invariably do, finding food for subsistence. His menu is remarkably varied – dogtooth violet bulb and dandelion greens salad, fresh water mussels, hickory nuts, crow eggs, baked cattail roots, turtles, trout, mushrooms, venison jerky, sassafras and pennyroyal tea, wild strawberries, and May apples. Seeing a peregrine falcon soaring above, Sam is inspired to become a falconer to ensure a consistent meat supply. He plucks a chick from its cliff-side scrape and, with guidance from library books in the closest town, sets out to train her. Frightful becomes a magnificent bird and an accomplished hunter, and Sam has soon added rabbit and pheasant to his standard diet as well as the loyal companionship of a wild raptor. 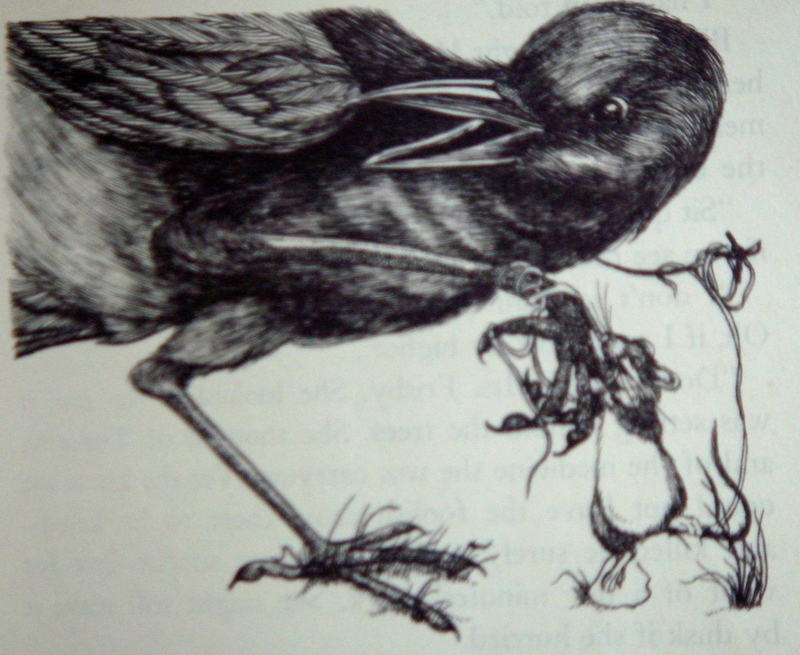 The two subsequent books in the series have a bit more rise and fall in the way of plot, aided by the appearance of bone fide villains, two scurrilous bird poachers. But it is remarkable that a book in which the greatest suspense comes from the uncertainty of whether Frightful will continue to brood her eggs in the face of bridge repairs could be so captivating. Jean Craighead George has devoted her writing career to exploring the interface between humans and nature and she grapples with all its messy complexity. She writes about a real world in which predators kill prey, humans sometimes act with venal intent, political decisions have unanticipated destructive consequences. At the same time, people and wild animals have mutually dependent relationships of deep affection, children are able to effect positive change, and endangered species are brought back from the brink through environmental activism. 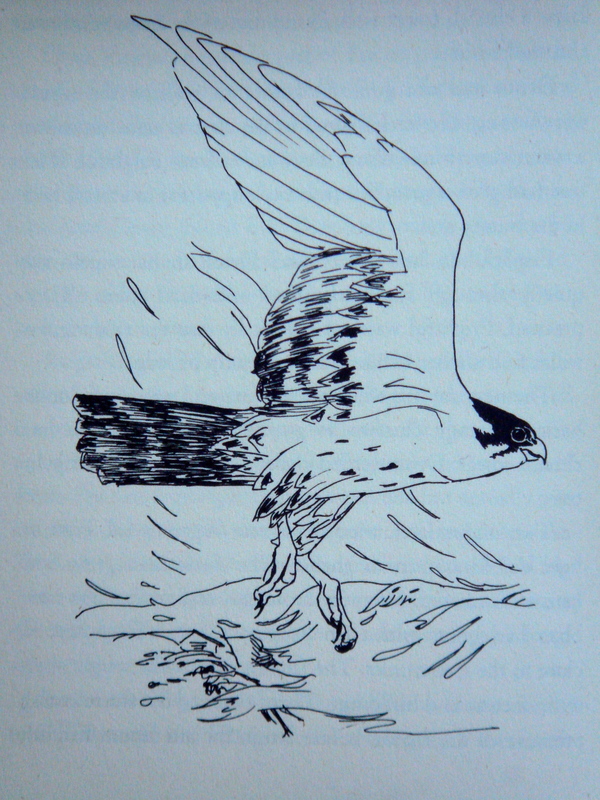 Robert F. Kennedy, Jr., in his forward to the third volume, cites My Side of the Mountain as the formative book leading to his fascination with falconry and career as an environmental lawyer, and he is not alone in having found inspiration in this book while an impressionable child. Jean Craighead George was raised in a family of adventurous naturalists and she knew her material firsthand. 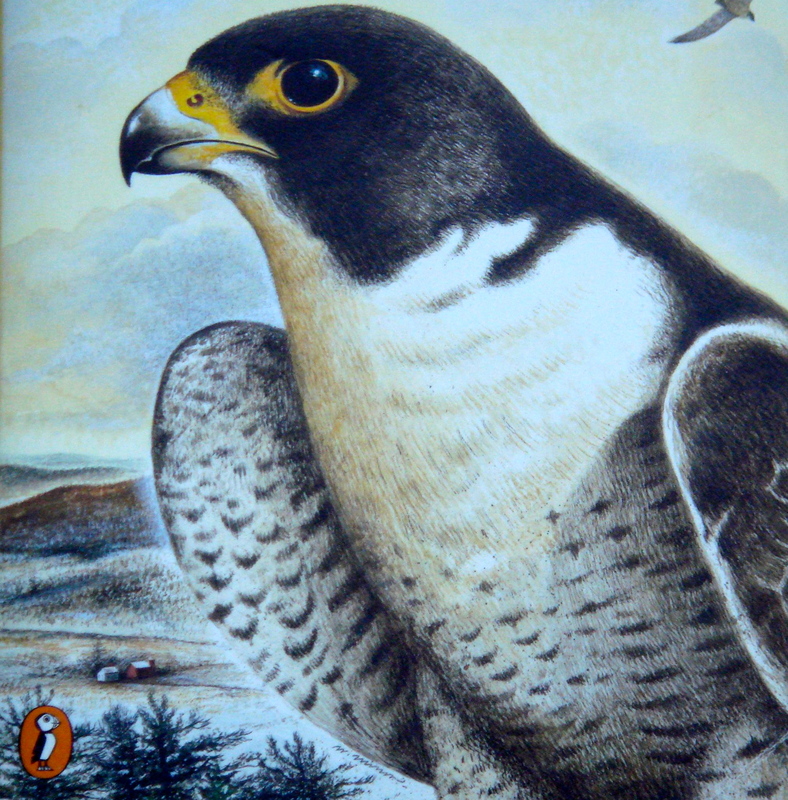 Her entomologist father taught his three children how to survive in the wilderness and all three became accomplished falconers as adolescents. Her books, and especially her illustrations, provide a how-to manual for any child who wants to follow in Sam’s footsteps. Some years after launching her Sam Gribley series, George spent a summer studying wolves in the tundra of Barrow, Alaska, and she was inspired to write her second noteworthy trilogy, beginning with the Newberry Medal winning Julie of the Wolves. 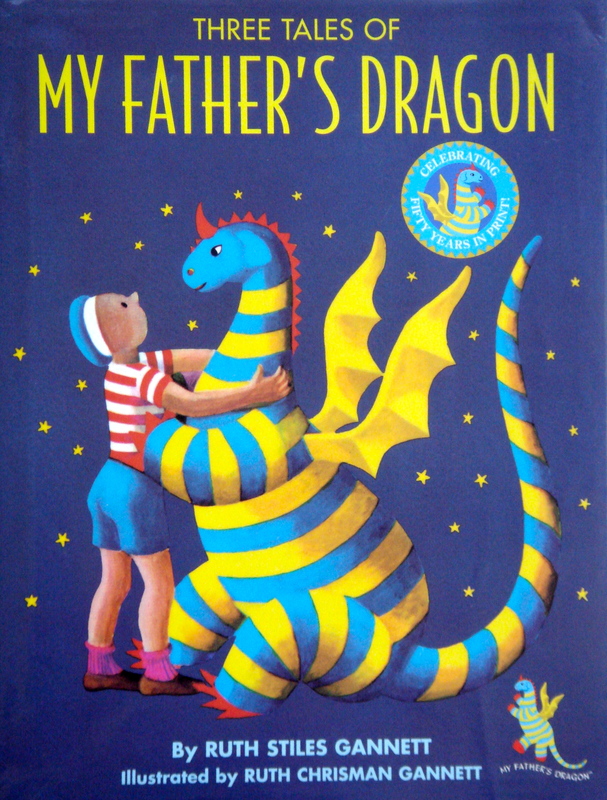 Consider the diversity of dragons in children’s literature. At one end of the spectrum is the fire-breathing princess-snatching type favored by St. George. Think of Smaug, Bilbo Baggins’ nemesis in The Hobbit. Then there is the warrior dragon fighting the dark forces, exemplified by Saphira (a rare she-dragon), raised from a hatchling by Eragon, the Dragon Rider, created by the boy wunderkind, Christopher Paolini. At the other end is The Reluctant Dragon, a pacific poet created by Kenneth Grahame, who strikes a bargain with St. George to stage a mock battle that will appease their fans. Somewhere in between are the dragons, a plague of them, created by the inimitable E. Nesbit in The Deliverers of Their Country (a story in the collected The Book of Dragons) – dragons that create a nuisance, beginning with the tiny one that lands in Effie’s eye, and that are ultimately dispatched through the matter-of-fact ingenuity of children. The dragon in Ruth Stiles Gannett’s trilogy resembles a balloon in a Macy’s Thanksgiving day parade. 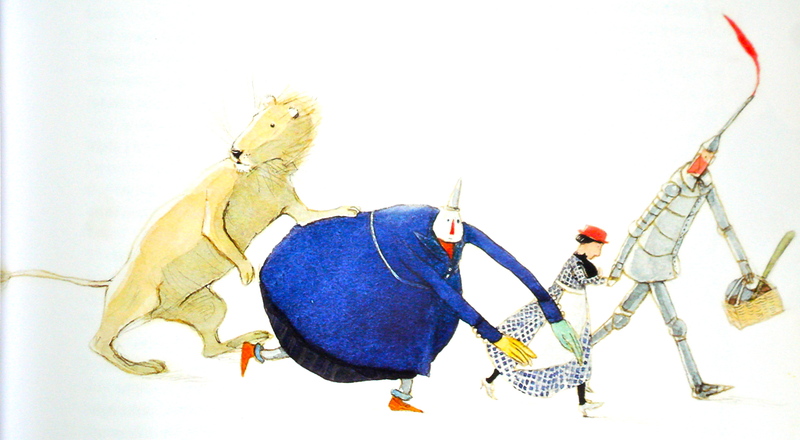 Adorned with blue and yellow stripes, golden wings, and red accents, he has the appearance of a friendly blimp, as drawn by Ruth Chrisman Gannett (the author’s stepmother). My Father’s Dragon begins with 9 year old Elmer Elevator befriending an old alley cat. 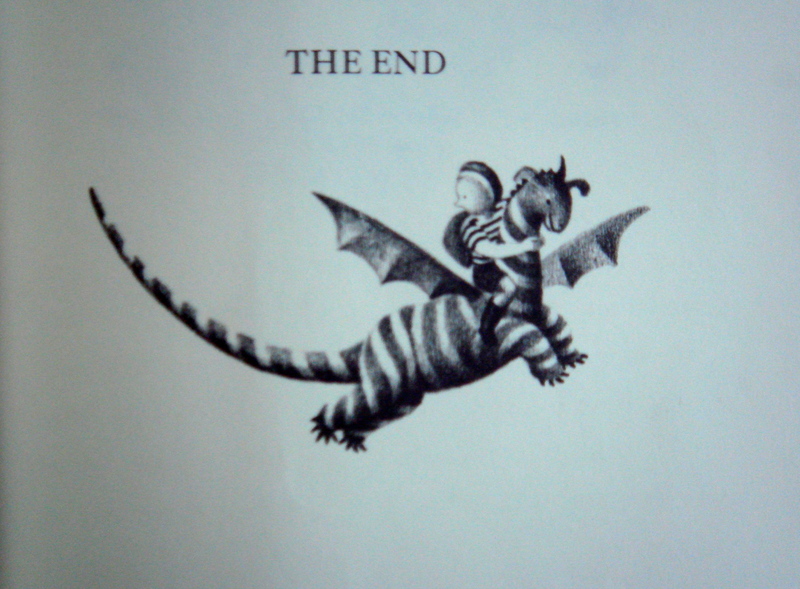 Upon hearing that Elmer longs to fly, the cat tells him of a baby dragon being held captive on Wild Island. Elmer assembles a curious assortment of odds and ends (including chewing gum, pink lollipops, rubber bands, magnifying glasses, multi-colored hair ribbons, and 25 peanut butter and jelly sandwiches) and stows away on a ship bound for Tangerina. 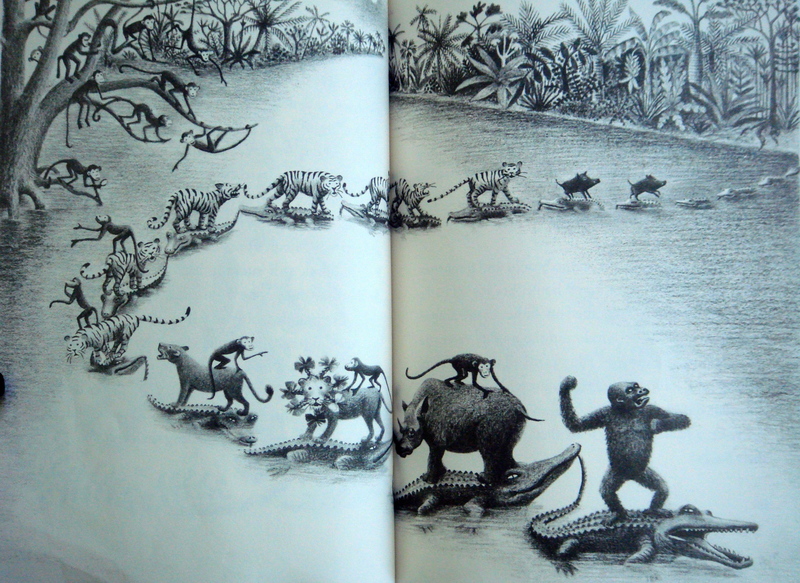 Making his way to Wild Island, he encounters wild boars, tigers, a rhinoceros, a lion, a gorilla. The most entertaining is a mouse that transposes his consonants, as in “’I must smell tumduddy. I mean, I must tell somebody.’” Elmer’s assorted possessions provide the various diversions needed to distract the beasts, most famously when he attaches a pink lollipop to the tail of each crocodile with a rubber band, thereby prompting them to create a lollipop-sucking crocodile bridge across the river. Freeing the baby dragon from captivity, the two float away, thus fulfilling Elmer’s dream of flight. The book is disarmingly simple. It has an airy freshness and naivete that is instantly appealing. Gannett, four years out of Vassar, wrote the book effortlessly over a two week period in between odd jobs. 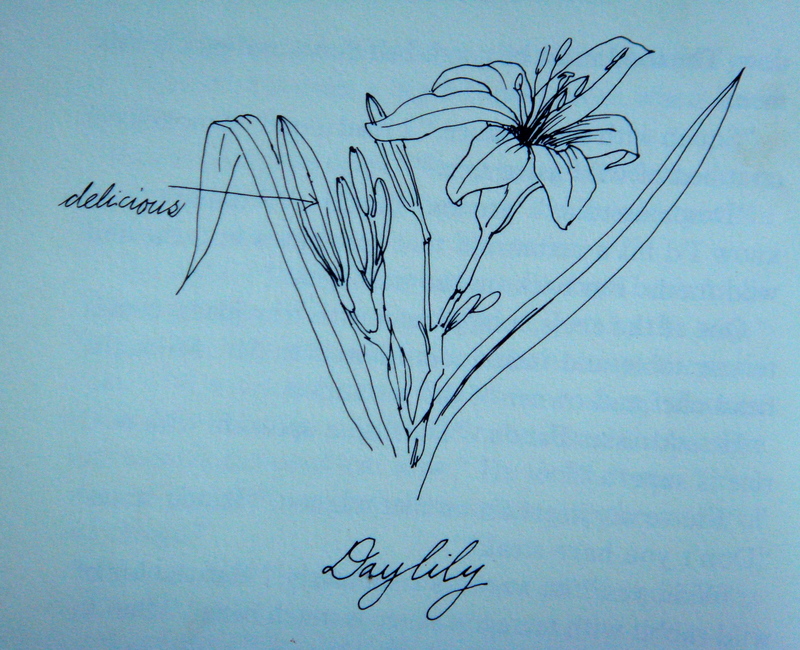 Her stepmother, an established artist, provided illustrations and encouraged publication. The two continued their collaboration with Elmer and the Dragon and The Dragons of Blueland. Everyone knows the story. A trio of animals, two dogs and a cat, cross 250 miles of Canadian woods to be reunited with their owner family. They pass in and out of the lives of a medley of wilderness residents – an Ojibway clan at a wild rice harvest, a hardscrabble Finnish immigrant family, an eccentric hermit, a kind-hearted elderly couple – all of whom offer momentary respite from the hardships of the journey. They encounter, to ill effect, a series of wild animals – a bear cub and mother, a lynx, a porcupine. Sustained by their mutual loyalty and the unwavering determination of their leader, they succeed. We know there will be a happy ending, but the book has emotional force. While Luath and Tao are having their joyous reunions, there is not a dry eye when young Peter presumes his dear Bodger to be dead, though we know the dog is not far behind. Sheila Burnford was a keen observer, and this is the reason for reading the book rather than leaving the plot line to the two movies that have popularized the story. She brought the eyes of a newcomer to the Canadian wilderness (she was a transplant from post-war England) and her detailed descriptions of the Indian summer woods mark the passage of time and create a depth of natural setting unusual in a children’s book. She was also a sensitive observer of animals and she had an uncanny ability to capture the distinctive behaviors, characters, and interrelationships of her three protagonists – the Siamese cat, the young Labrador retriever, and the old white English bull terrrier. Old Bodger – irrepressible, good-humored, clownish, ingratiating – was Burnford’s obvious favorite. She describes his nautical rolling gait and gargoylish grin with the sure touch of one who knew this animal well. 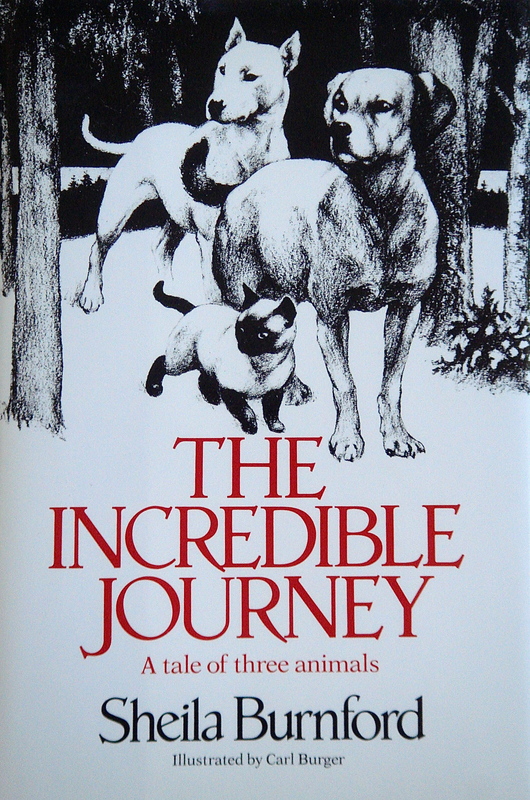 All three animals were based on pets that she had owned. Burnford brings this same sixth sense for animals to Bel Ria, a little known gem of a book. It was not written for children, but then neither was The Incredible Journey. 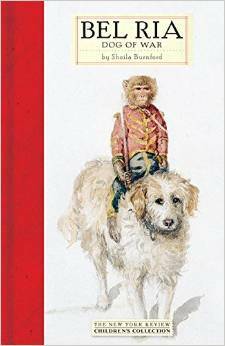 It concerns a spirited little performing dog who travels the open roads of France with a monkey, a horse, a donkey, and a Gypsy couple. When the Gypsy caravan is strafed by a German stuka during the 1940 Allied retreat, the surviving dog and monkey attach themselves to an English corporal who had been aided by the Gypsy woman when he was wounded. He manages to smuggle them aboard the Lancastria during the chaotic evacuation, and together they survive the sinking of the ship (4,000 others were not so fortunate) and eight hours in the oil-coated Atlantic until they are rescued by a British destroyer. The dog, as Ria, becomes the charge of the brusk sick berth attendant and then, as Bel, the pampered pet of an imperious semi-invalid spinster, both of whom are transformed by his passage through their lives. 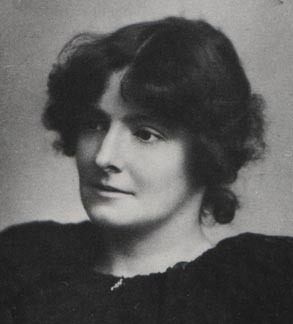 Burnford is extraordinary in creating the scenes of war – the dusty streams of refugees fleeing the German invasion of the Loire Valley, the plight of drowning men necessarily abandoned by the convoy crossing the Atlantic, the terror of crazed animals running amok during the Plymouth blitz (she was a volunteer ambulance driver at the time). She is equally extraordinary in portraying the nuanced complexity of a small dog swept up by war. For a book that few people in the 21st century have actually read, Hans Brinker or the Silver Skates is surprisingly well-known. Mention the title and indistinct recollections of wooden shoes, an exhilarating race, and the boy with his finger in the dyke will surface. The book was an immediate success when it was published in 1865 and the story continues to inspire tourism in Holland a century and a half later. All of which is a testament to the excitement of the tale. Hans and Gretel Brinker, virtuous children who remain plucky in the face of hardship, live with their parents in a humble cottage on the banks of a frozen canal. Their father suffered a head injury while working on the dykes a decade earlier which left him witless. Locked within his inaccessible memory are the whereabouts of their 1,000 guilder savings and the secret of a mysterious watch entrusted to his care. While the children struggle to obtain help for their father from the gruff Dr. Boekman, their spirits are buoyed by their anticipation of the upcoming race, the prize for which will be silver skates. The plot is unabashedly melodramatic and the cast of supporting characters unabashedly stereotypic: the nasty, bitter Carl Schummel who gets his comeuppance in the end, the fat, good-natured, prone-to-napping Jacob Poot, the generous burgomaster’s daughter, Hilda van Gleck, the empty-headed coquettish Katrinka Flack, the English Benjamin Dobbs who provides an opportunity for comic relief (otherwise rare) when others speak to him in heavily accented English (“Penchamin, I no likes be called Tutch – dat ish no goot. I bees a Hollander.”) All of which is appealing to children. What is less appealing is the encyclopedia of trivia about Holland, ranging from the carvings on Dutch pipes to catalogues of museum contents. 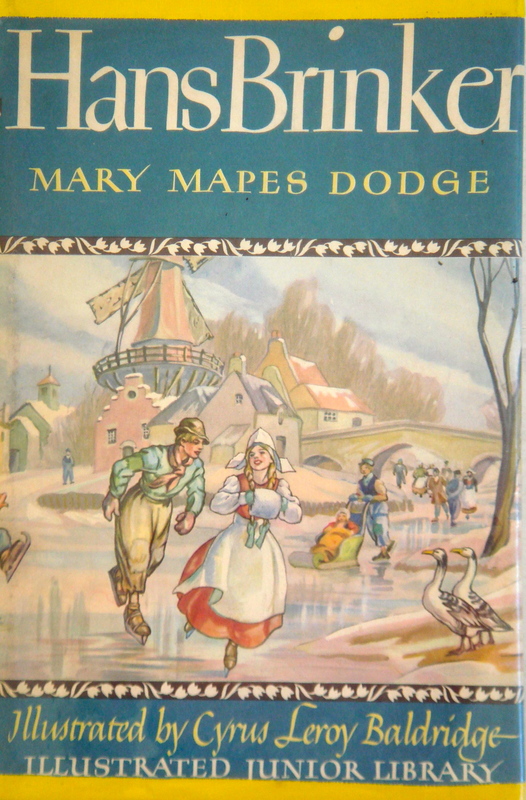 Mary Mapes Dodge wanted to present an instructional travelogue, a somewhat audacious goal, given that she had never been to Holland. The book is flawed by an irrelevant subplot which accompanies a group of boys on a 100 mile sightseeing tour. But while some of the descriptions are insufferably dry (e.g., bits of obscure Dutch history, descriptions of gallery paintings), Dodge manages to pack a remarkable amount of information into the pages, all of which paints a detailed portrait of mid-nineteenth century Dutch life. 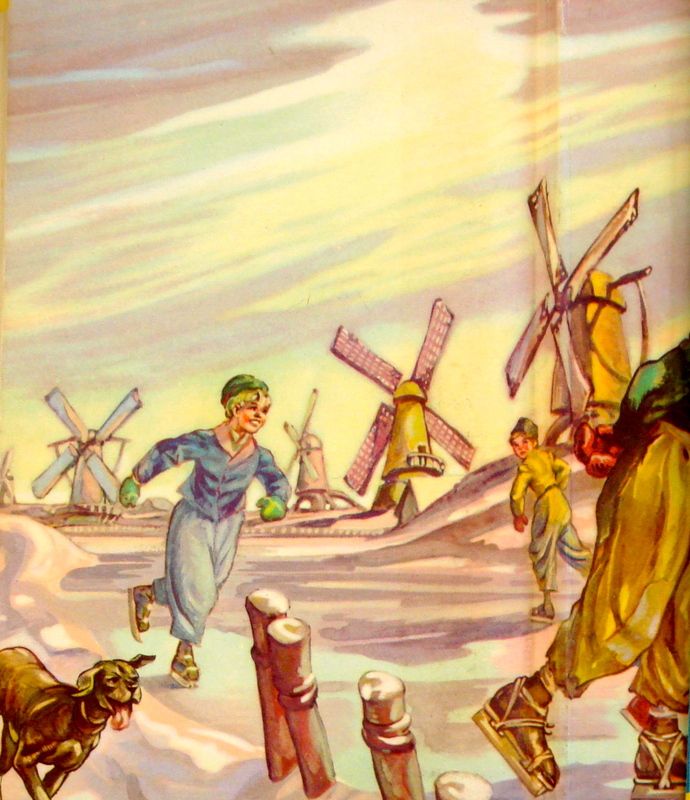 As our world warms, images of ice skating Hollanders, once such a defining symbol of Dutch culture, are becoming a thing of the past, and it is worth having a text that captures a vanishing way of life. The Dutch are somewhat disparaging of Dodge, the self-styled cultural historian, particularly when it comes to the boy with his finger in the dyke. The fictional story of “the hero of Haarlem” appeared in various guises in France, England, and the U.S. during the 1850’s, but it was Hans Brinker that transformed the boy into a popular icon as well as the personification of “the pluckiest little country on earth”. The story begins in an old-fashioned Beatrix Potter kind of way with a family of field mice living on Mr. Fitzgibbon’s farm. Mrs. Frisby, recently widowed, is anxious for her frail son, Timothy, who is delirious with fever. The family must move to their summer lodging before Mr. Fitzgibbons ploughs their field and upturns their home, but the chill spring air during the move might by more than Timothy can survive. 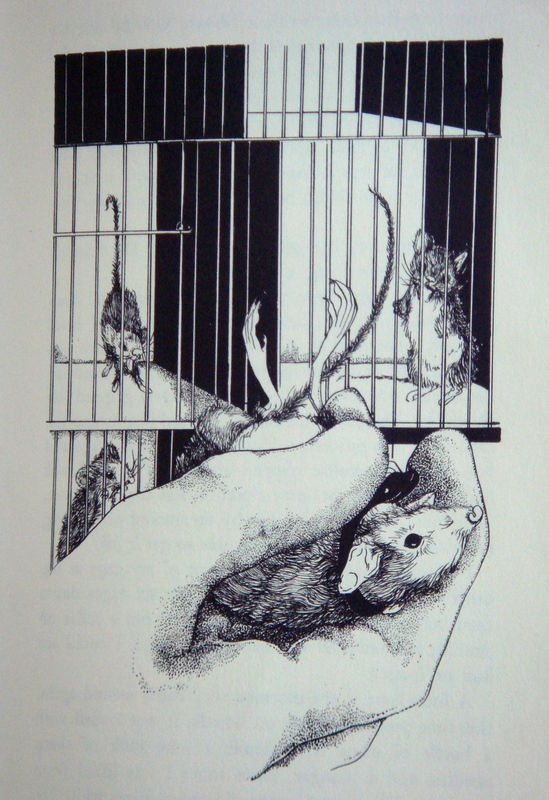 Mrs. Frisby eventually seeks the advice of Nicodemus, the wise rat, and here the book takes a strange turn. In the story-within-a-story centerpiece of the book, Nicodemus recounts a fantastical tale. 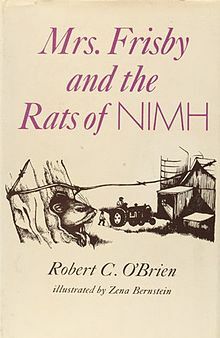 Caught up in a sweep of a farmer’s market, the young Nicodemus was taken to NIMH (based upon the real National Institute of Mental Health) where he became a research subject in an experiment designed by the neurologist, Dr. Schultz. Nicodemus was one of a group of rats and mice who received DNA and steroid injections to boost their learning ability and slow their rate of aging. Taking advantage of their newfound knowledge (which included the ability to read the directions for opening their cage doors), they made their escape from NIMH, overwintered on an estate with a sizable library, happened upon a toy tinker’s truck which contained miniature tools and engines, and settled on Mr. Fitzgibbon’s farm where they constructed an elaborate burrow complete with electric lights, a working elevator, and a radio. Over time, Nicodemus developed moral qualms about a rat’s life of thievery, and a plan evolved to create a utopian Shangri-La of self-sufficiency in a remote valley. The rats offer to help Mrs. Frisby move her home to safety, thus ensuring the salvation of Timothy. She, in turn, overhears Mr. Fitzgibbons talking about an impending visit of exterminators (it turns out that Dr. Schultz has gotten wind of their whereabouts), thus alerting the colony just in time for them to make their escape. There is plenty of excitement along the way, including the ever-present danger posed by Dragon the cat. The book is unique in its combination of standard talking animal fare and futuristic super-rat fantasy. It is not only an arresting story, but also one that stimulates thought-provoking questions about intelligence, longevity, animal experimentation, genetic engineering, and ethics. It was in part for the book’s moral complexity that it was awarded a Newberry Medal. The Pushcart War turns out to be surprisingly memorable – the image of the pea shooters persists long after the book is closed, along with a comforting sense of something quietly important having been accomplished. David and Goliath stories are understandably satisfying to children, and there are many that have been written. This is a highly unusual one. 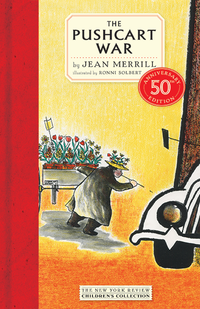 The Pushcart War of 1976 begins with the Daffodil massacre in which the pushcart of Morris the Florist is flattened by a Mammoth Moving truck and the unfortunate flower peddler is launched headfirst into a pickle barrel. In response to this act of blatant aggression on the part of the trucking companies, the pushcart peddlers go on the offensive, led by Maxie Hammerman (the Pushcart King) and General Anna (vender of apples and oranges). Their secret weapon, invented by the son of a Hispanic peddler named Carlos, is a yellow rubber straw loaded with a dried pea with a pin stuck through. During the Pea Shooter Campaign, the peddlers bring the trucks to a standstill, 18,991 flat tires to their credit. When Frank the Flower is arrested and the peddlers are forced to desist, the children of Manhattan quickly take up the battle in their stead. Through the unintentional complicity of a cleaning woman who practices her shorthand on an overheard conversation between The Three (as the owners of the three trucking companies are known), Maxie Hammerman is warned that he is targeted for kidnapping. In a delightful scene, The Three are tricked into a poker game at which the Police Commissioner is present (he is on the side of the pushcarts), and Maxie ends up winning $60,000 and an Italian bullet proof car. And on it goes, until the two sides make their peace. 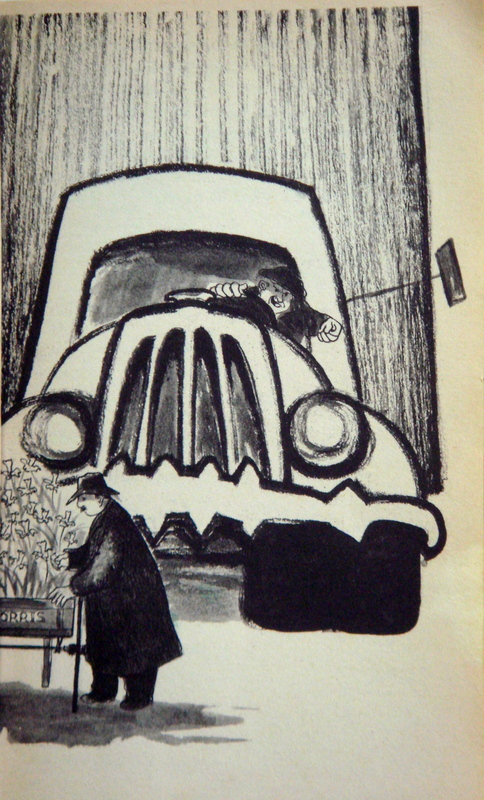 The book is unconventional in format (it is a mock historical document, set in the future, complete with footnotes, newspaper articles, and transcribed conversations) and unusual in its juxtaposition of humor with serious social themes (political corruption, working class oppression, citizenry revolt). Most unique is the use of adult characters (and many of them), none of whom take center stage. Most books for children feature child or animal protagonists, but in this story the few named children have walk-on parts at best. It turns out to make not a whit of difference to the children reading the book, many of whom become devoted fans.